Strange as it might seem, including some vinegar in your diet may improve your bodyweight and lower your blood glucose levels. The biologically active constituent of vinegar is acetic acid, which also happens to be the ingredient that causes people to pucker their lips at the taste of vinegar. Acetic acid inhibits the activity of several carbohydrate-digesting enzymes, including amylase, sucrase, maltase and lactase. As a result, when vinegar is present in the intestines, some sugars and starches temporarily pass through without being digested, so they have less of an impact on blood sugar and body fat accumulation. Vinegar has long been proposed as an agent to assist in weight loss. One theory is it extends satiety (the sensation of feeling full) after eating. Another hypothesis is that the acetic acid increases the fatty acid oxidation enzymes in the liver, causing an inhibition of body fat accumulation. Acetic acid is the active ingredient in both apple cider and balsamic vinegar. So, which vinegar is better for aiding you in your weight-loss efforts? Balsamic vinegar is an aromatic, aged type of vinegar, which is traditionally made from the concentrated juice or must of white grapes. It is very dark brown in color, and its flavor is rich, sweet and complex. Most aged balsamic vinegars are very expensive, although the commercial balsamic vinegar, which is sold in supermarkets, is typically made with concentrated grape juice mixed with a strong type of vinegar. Regardless of how it is produced, balsamic vinegar must be made from a grape product. Balsamic vinegar has a high acidity level, but the tart flavor is usually hidden by the sweetness of the other ingredients, making it very smooth and tasteful. Balsamic vinegar contains a very low caloric content, and finding low-calorie foods is always the focus when trying to lose weight. Take, for instance, one tablespoon of balsamic vinaigrette salad dressing. It contains only 43 calories when compared to other creamy salad dressings that contain double of what balsamic vinegar contains. 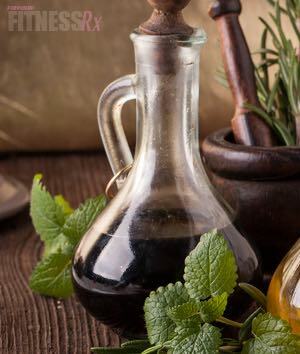 It has been suggested that when balsamic vinegar is consumed with carbohydrates, it keeps the blood sugar levels from rapidly increasing, thereby preventing sugar crashing later, which causes people to eat more. Balsamic vinegars also contain resveratrol, which is a powerful antioxidant that is derived from various types of berries— especially grapes. It has been shown to have several positive cancer and weight-loss benefits. Studies have shown that the natural substance found in red wine and grapes offsets the bad effects of a high-caloric diet and helps to foster longevity. It is believed that resveratrol promotes weight loss by triggering the SiRT1 gene that is responsible for reducing fat stores in low-calorie diets. The research on resveratrol’s weight-loss benefits also indicates the possibility that its antioxidant properties may trigger certain receptors in the upper intestines, allowing for that prolonged feeling of being full. 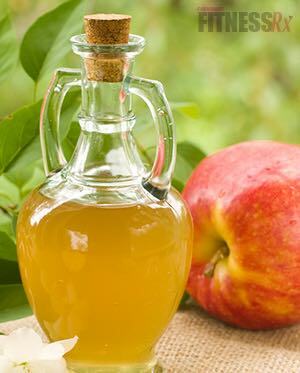 Apple cider vinegar is known simply as cider vinegar or ACV. It is made from cider or apple-must, and has a brownish-yellow color. Because of its acidity, apple cider vinegar may be very harsh, even burning, to the throat. Some claim apple cider vinegar is the better vinegar for weight loss because it contains the highest amounts of purifying and health-promoting potassium, which acts as a fat-flushing agent. Apple cider vinegar is also known to increase a person’s metabolic rate, leading to a greater caloric expenditure. It also aids in minimizing water retention in the body, which may increase a person’s energy by making them not feel so sluggish. People who are insulin-dependent diabetics that have to take insulin with their meals may even be able to lower their quantities after using apple cider vinegar because it aids in lowering circulating blood glucose (sugar). The prescription for apple cider vinegar is to drink one to two tablespoons mixed in eight ounces of water before each meal. A desirable option may be to add one to two tablespoons of honey to enhance the taste. Balsamic and apple cider vinegars are particularly healthful, delicious ways to get more acetic acid into your diet, without adding fat. You can use balsamic or apple cider vinegar as a sauce when cooking or marinating chicken or meats. These vinegars also make great choices for salad dressings in place of dressings containing fat and sugar. In addition to adding vinegars, following a healthy diet, such as the Mediterranean diet— which includes vegetables, fruits, whole grains, legumes and nuts, fresh fish and olive oil— can help assist in weight-loss efforts and prevent heart disease. So which vinegar is better for weight loss? It’s all about personal preference. Although some research states apple cider vinegar to be the superior calorie fighter, the taste may be the dominating decision maker for most people. Since both vinegars contain the active ingredient acetic acid, it simply comes down to fondness. Akeredolu A. & Kashaf, S. Does vinegar have health benefits? Clinical Advisor for Nurse Practitioners 14(2): 102-107. Cunningham E. & Marcason W. Is it possible to burn calories by eating vinegar? Journal of the American Dietetic Association, 2001; 101(10): 1198-2010. Kondo, T. et al. Vinegar intake reduces body weight, body fat mass, and serum triglyceride levels in obese Japanese subjects. Biosci, Biotechnol, Biochem, 2009; 73: 1837-1843. Kondo, T et al. Acetic acid upregulates the expression of genes for fatty acid oxidation enzymes in liver to suppress body fat accumulation. J. Agric. Food Chem., 2009; 57 (13): 5982–5986. Ostman E, Granfeldt Y, Persson L, et al. Vinegar supplementation lowers glucose and insulin responses and increases satiety after a bread meal in healthy subjects. European Journal of Clinical Nutrition, 2005; 59: 983-988. Tomoo K., Mikiya K., Takashi F. & Takayuki K. Acetic acid upregulates the expression of genes for fatty acid oxidation enzymes to suppress body fat accumulation. Journal of Agricultural. Food Chemistry, 2009; 57 (13): 5982–5986.